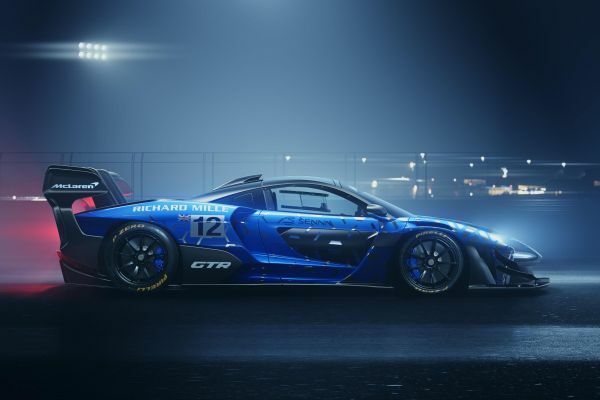 08.03.2019: The McLaren Senna GTR is powered by the most extreme version yet of McLaren’s 4.0-litre twin turbocharged V8 engine. The M840TR unit, with electronically controlled twin-scroll turbochargers, produces 825PS (814bhp) with 800Nm (590lb ft) of torque. 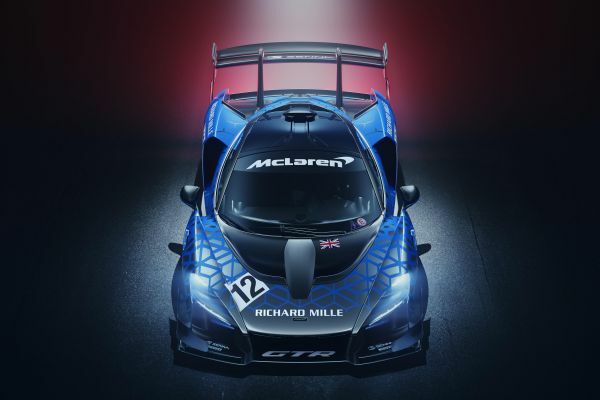 The McLaren Senna GTR is powered by the most extreme version yet of McLaren’s 4.0-litre twin turbocharged V8 engine. The M840TR unit, with electronically controlled twin-scroll turbochargers, produces 825PS (814bhp) with 800Nm (590lb ft) of torque. The extra 25PS over the engine in the McLaren Senna has been achieved by engine control recalibration and removing the secondary catalyst to reduce back pressure. Removing the catalyst also heightens the aural experience of driving the McLaren Senna GTR. 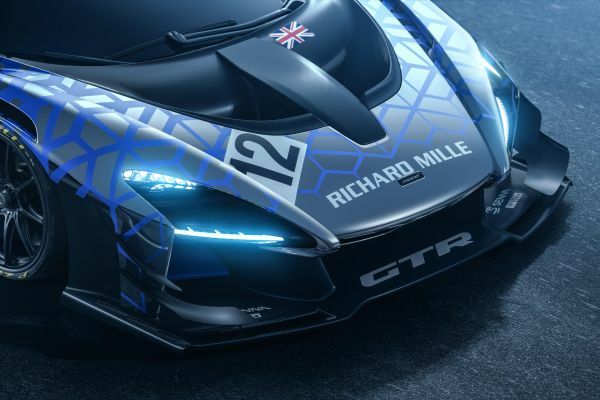 The McLaren Senna GTR generates astonishing levels of downforce, peaking at more than 1,000kg, a significant increase over the 800kg developed by the road-legal McLaren Senna at 250km/h (155mph). Crucially, a completely different downforce ‘curve’ means the McLaren Senna GTR can call on an equivalent amount of downforce to the McLaren Senna at 15% lower vehicle speed, while still benefitting from reduced drag. The aero package of the McLaren Senna GTR delivers positive effects in high-speed corners but also in low-speed curves and under braking, making the car even less pitch- sensitive and enhancing stability in all situations. 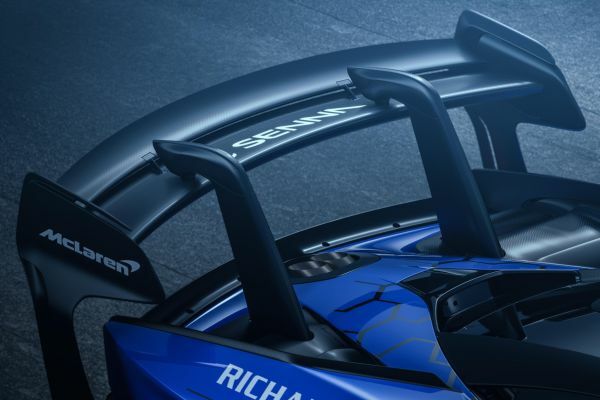 At the core of the McLaren Senna GTR is a McLaren Monocage III-R central structure, a carbon-fibre safety cell with integrated roll cage and uniquely, integrated harness mounting points. Like the road-going McLaren Senna, there is an aluminium front subframe and aluminium engine frame, with composite crash beams front and rear. The extreme, racing-inspired nature of the carbon-composite body appears more purposeful than ever, clothing a chassis that is wider still than that of the Senna and lower than the road-legal Senna by 34mm, at 1,195mm in height. Front track has increased – by 77 mm to 1,731mm – and rear track is wider by 68 mm, at 1,686 mm. suspension, which enables different ride heights for road and track, is superfluous in the track-only car and to save weight and reduce complexity has been replaced with aluminium double wishbones, springs, uprights and anti-roll bars developed from the suspension of the GT3 cars used for McLaren’s customer racing programme. Four-way adjustable dampers are fitted, as are solid bushes and adjustable camber.